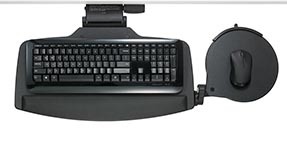 KnollExtra Keyboard Supports are a key element to maintaining ergonomic comfort throughout the day, allowing users to maintain a neutral posture, thereby avoiding unnecessary strain. The collection of streamlined platforms and mechanisms offer ultimate user adjustability while easily stowing away to free up valuable desktop real estate. With an on-board mousing surface that seamlessly transitions from right to left handed use, Integrated platform offers a streamlined design especially ideal for shared or hot-desking workspaces. Swivel is scaled to fit nearly any workspace. With a rotating mousing surface that can be fully stowed underneath the platform, this is the most versatile solution. 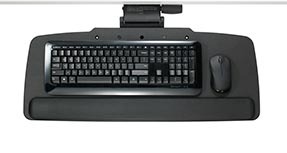 The most ergonomic keyboard platform, Swivel HP features a height adjustable mousing surface allowing it to be positioned directly over the numeric keypad supporting the ideal neutral arm and wrist posture. The Short Easy Lift is a compact mechanism perfect for shallower worksurfaces and height-adjustable tables where clearance is at a premium. The Advanced Easy Lift is a thin, lightweight mechanism for maximum leg room and comfort. It features a visible gauge for both height and tilt making it easy to adjust for personal fit. 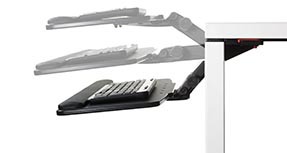 The Advanced Easy Lift Arm is also available with a dual pivot feature. Dual pivot provides you with an extra pivot point on the keyboard platform. 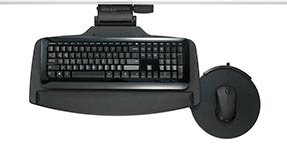 This allows you to move your keyboard platform independently from the arm, helping you keep your keyboard platform parallel with your desk. 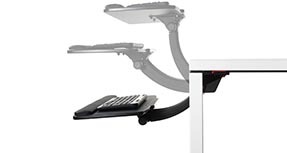 The Sit/Stand mechanism offers over 14” of height adjustment to support sit-to-stand work modes. Dual pivot is also available on the Sit/Stand arm. Dual pivot provides you with an extra pivot point on the keyboard platform. 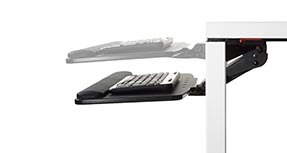 This allows you to move your keyboard platform independently from the arm, helping you keep your keyboard platform parallel with your desk. Knoll Keyboard Supports ship with your choice of track length so that they fit your desk perfectly. Be sure to measure your desk for the appropriate track before ordering. Available track lengths 16" 18" 22" 23" 25"
This product comes standard with a 10-year limited warranty.